Yes, the Denver Nuggets are back in the playoffs after six long years, but the second-seeded Nuggets are far from satisfied. 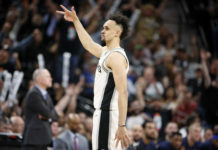 Now that they are in the postseason, they are ready to find out what a first–round victory tastes like, but in order to reach that goal, they will have to find a way to defeat the San Antonio Spurs. That task is not going to be easy. The Spurs are a talented team and have arguably the greatest head coach of all time as their battle commander. If Denver wants to win their first playoff series since the 2008-09 season, there are a few things they are going to have to do. There is one big question that is hovering over Denver as they inch closer to their first-round matchup with the Spurs. Which version of the Nuggets will show up on a game-by-game basis? Denver has been the second-best team in the Western Conference for long stretches of the season, but during other periods of time, they have looked like a team fighting to even make the playoffs. The only real difference between the two different versions of the Nuggets is their attentiveness and level of effort. If the Nuggets show up concentrated, focused and play with great effort, they should be able to win the series with time to spare. If they fail to play consistent basketball for 48 minutes or make arbitrary and avoidable mistakes, the Spurs could upset Denver. This is the type of avoidable turnover that Denver absolutely cannot afford to make against the Spurs; particularly when Denver heads out on the road to face the Spurs in San Antonio. Jamal Murray, instead of just outright attacking the middle of the paint, drives to his right directly into Derrick White, who is an underrated defender himself. Once Murray realizes that White has walled off his path, he panics and tries to dribble behind his back when all he needed to do was either kick the ball out to Barton or just reset the offense himself. Instead of staying calm, Murray turned the ball over which sparked a (very slow) three-on-one fastbreak opportunity for the Spurs, which they converted with ease. The Spurs feast on teams that shoot themselves in the foot. They are the ultimate opportunists who wait for an opening to present itself before they strike and defeat their enemies. That means Denver’s awareness and attention to detail has to be better than it has been all season long. Monte Morris takes his eyes off of Patty Mills for a total two seconds as he goes after the rebound in the clip above, but that allows Mills just enough time to sneak down the baseline and steal the ball from Morris, who is as sure-handed as any ball handler in the entirety of the NBA. The Spurs simply do not have enough talent to keep up with Denver’s arsenal of weapons, but if Denver begins giving away points unnecessarily by turning the ball over and other random miscues, they will provide an opportunity to the Spurs to not only hang around, but potentially win the series. When the Nuggets become just a jump-shooting team, they lose what makes them so dangerous, but when they attack the paint and collapse the defense, their offense arguably shines brighter than any other in the National Basketball Association. There is almost never a time when the Nuggets have less than four shooters and four players who can handle the ball on the floor at the same time. Because of that, when Denver gets the defense scrambling, they are nearly unbeatable. But to get the defense scrambling, the Nuggets need to get downhill and attack the paint. Look at the clip below. Once Millsap gets into the paint, all five of the San Antonio defenders turn towards him which leaves Millsap with three different shooters to kick out to. Look at how Malik Beasley and Monte Morris are wide open at the top of the key while Gary Harris also has a decent amount of space between him and Patty Mills in the far corner. The Spurs are the seventh-worst team at defending spot-up possessions so getting into the paint and kicking out to shooters is how Denver can exploit that weakness. According to Synergy, the Spurs are the lest efficient transition defense in the NBA while the Nuggets are stocked full of athletic guards who want to run the break and plenty of players who can grab a rebound and push the ball up the floor quickly. That means, if the Nuggets can get out in transition, they could create easy points for themselves. In the Nuggets final game of the regular season against the Spurs, it was clearly a priority to push the pace as often and as hard as possible. That strategy makes a lot of sense because the Nuggets can create more efficient scoring chances while also dictating the pace of the game. If Denver can create easy buckets and control the pace of the game, it is going to be an uphill battle for the Spurs. Look at how fast Denver turns a missed basket into a transition bucket for Harris. Plumlee gets the rebound, takes two step and a dribble, and then throws a hit-ahead pass to Harris who races past Patty Mills for the easy layup. Denver needs to try to get out and run every opportunity they get if they want to control the tempo of the game as opposed to reacting to the slowed-down style that the Spurs prefer. There is no reason that Jokic should be anything less than a superstar against the Spurs because San Antonio literally has no answer for him unless they out-right double him to get the ball out of his hands. Even with that being said, Jokic has one of the stranger statistical profiles against the Spurs. He is averaging just 16.8 points per game against San Antonio, but is doing so while shooting a blistering 69.8% from the field and 50% from 3-point range. In addition to his hyper-efficient scoring, he is also averaging 8.5 rebounds and 8.5 assists in 33.7 minutes per game in his four meetings with the Spurs. So what is the issue? Well, he is sporting a minuscule 20.4 usage percentage and only taking 10.8 shots per game despite the fact that the Spurs have no one who can match up with his combination of skill, size and intelligence. 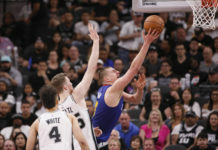 If Jokic decided to punch first and punch often in Denver’s playoff series against the Spurs, there really is no one on San Antonio’s roster who can stop him from doing so other than Jokic himself. Look at him just toy with Jakob Poeltl in the clip below. Poeltl may not be a household name, but there is a reason that nearly every Spurs player is better when sharing the floor with him. But against Jokic, he is just another victim. Poeltl knows that Jokic has extremely soft touch so he has to play him close by fighting through Murray’s pin-down screen. Once Poeltl gets through Murray’s screen, Jokic is already prepared to use Poeltl’s weight distribution against him. Once Poeltl closes out on Jokic and begins to leave his feet to contest the mid-range jumper, Jokic puts the ball on the floor and attacks the painted area off the dribble. This is when Jokic strikes again. Poeltl knows that Jokic’s floater is lethal so he desperately tries to recover after biting on the pump fake, but Jokic uses that recovery to bait Poeltl into a foul leading Jokic to his and-one opportunity. 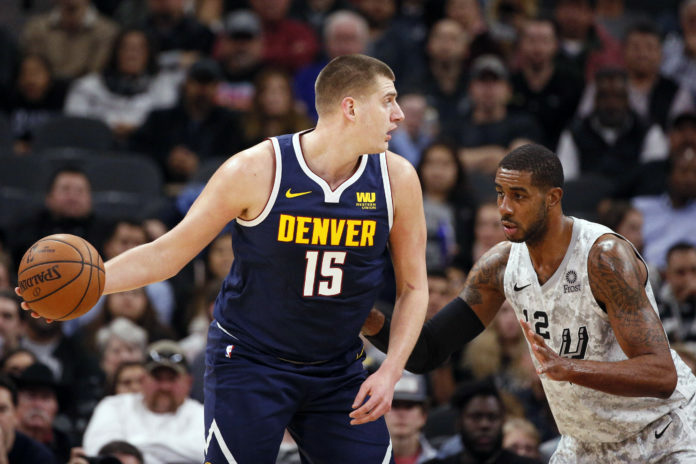 Jokic’s assertiveness is going to be a key to the Nuggets ability to beat the Spurs in the playoffs. Look at this clip below. Jokic knows that DeMar DeRozan had already switched onto him so instead of waiting for the play to develop, Jokic asks for the ball and just annihilates DeRozan’s attempt at guarding him. Jokic completely destroyed every mismatch that he had in the first four games and almost all of that destruction looked like this layup over Derrick White. Somehow, Jokic kept finding himself with a guard or wing player on him and he made short work of each and every mismatch that came his way, just as he does below to Bryn Forbes. Jokic easily corrals a high-arching post-entry pass from Murray with one hand and, without every putting two hands on the ball, easily converts the layup as if he was a water polo star. It does not matter who the Spurs throw at Jokic. If he gets anyone on the San Antonio roster in a one-on-one situation, he should be able to score at will. If the Spurs begin sending double teams and stunt down on him, he should be able to find open shooters and cutters all over the floor. Simply stated, the Nuggets will go as their best player goes physically and mentally. If Jokic mentally shows up prepared to attack the Spurs and not be reactive, his team will follow. If Jokic stays aggressive while on the floor, he will be able to score or create plays for others whenever he sees fit. The next priority is playing with great effort. The Spurs get the best defenses to scramble so Denver is going to have to communicate, play with great effort and sell out for each other if they want to slow the Spurs offense. The first priority for Denver on defense is being physical at the point of attack and keeping guards from breaking down the defense by getting into the paint. The Spurs are elite in terms of scoring efficiency at the rim and from beyond the 3-point line so if Denver can keep the Spurs in front of them, it will force them into longer mid-range shots. When the Spurs get penetration into the paint, they are able to create open 3-point shots like they do in the clip below. Mills gets into the paint, kicks the ball out to Davis Bertans who then collapses four Nuggets defenders by attacking the closeout and driving into the paint which leaves Isaiah Thomas stuck by himself defending two 3-point shooters. Again, the Spurs are the most efficient 3-point shooting team in the league. If the Nuggets allow them to take wide-open threes like that, it will increase San Antonio’s odds of a win dramatically. One of the Spurs offensive weaknesses is that they usually have a couple non-shooters on the floor which means Denver has the ability to pick their poison even while scrambling like they do in the clip below. Yes, DeRozan manages to get by Barton and force Murray to provide help defense, but Denver’s defense continues to communicate. Millsap jumped out to the corner to keep Millsap from getting a corner three while Harris splits the difference between Rudy Gay and Forbes. That is when Harris makes the calculated decision to not close out hard on Gay in order to bait him into taking the triple and not Forbes, who is a much better shooter from deep. If the Nuggets communicate and fly around on defense, they have the tolls and scheme to hold the Spurs offense in check. The most troublesome matchup for the Nuggets will be defending LaMarcus Aldridge because it does not matter who Denver throws at Aldridge. Denver just does not have any one player who can match his combination of quickness and power. Here is Jokic attempting to stay in front of Aldridge in the post, but Aldridge’s quickness is too much for Jokic to contend with. Once Aldridge makes his first move to the middle of the paint and gets Jokic to open up his hips to turn and run with him, it was all over for the first-time All-Star. Aldridge sensed that Jokic was out of position and elected to rise up and throw down a one-handed hammer dunk on top of Jokic’s head easily. In addition to Aldridge’s quickness, Jokic fails to put up much of a fight once he gets blown by. If the Nuggets are going to slow down Aldridge in a playoff series, it is going to require more effort than is shown above. Jokic was not the only Nuggets big that was abused by Aldridge. Millsap — for all of his talent, versatility, and the fact that he is built like one of the 300 Spartans that protected Sparta from Xerxes — has absolutely no chance in the post one on one against Aldridge, who is nearly 20 pounds heavier and about four inches taller than Millsap. The clip below is evidence of exactly that. With no baseline help coming for Millsap, he is basically stuck on an island with Aldridge, who spins baseline the second Murray stunts down to double him. Once Aldridge gets Millsap on his heels and into the painted area, he already lost. So, with neither Jokic or Millsap able to slow down Aldridge, Malone elected to start sending double teams his way in the post once he starts his dribble to try to get the ball out of his hands. While that may seem like it makes sense on paper, the Spurs are the most efficient spot-up scoring team in the league according to Synergy. That is what makes doubling Aldridge such a dangerous proposition. When the Nuggets send a double to Aldridge, like they do in the clip below, they are leaving a shooter open behind the 3-point line. That is why Marco Belinelli is able to get such a clean look at a 3-poitner despite him being one of the few volume 3-point threats on the Spurs roster. Malone is not going to throw one type of defensive coverage Aldridge’s way, but doubling him in a playoff series could be a damning decision. According to Ben Falk’s Cleaning the Glass, the Spurs are a top-five most efficient scoring team from all spots on the floor other than long mid-range two-pointers — Aldridge’s favorite spot on the floor. If the Spurs are elite at scoring from 3-point range and at the rim, maybe letting Aldridge take contested long-twos is the better of Denver’s selection of poisons to drink. 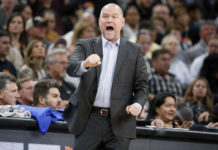 One of the toughest obstacles for the Nuggets to overcome is their demons in the AT&T Center in San Antonio and those demons will not be easily exorcised. Since the 2012-13 NBA season, the Nuggets have lost all 13 of their games in San Antonio which is frankly a staggering stat. To put that into perspective, that means it has been 2595 days since the Nuggets left AT&T Center with a win. If the Nuggets want to win their first-round series against the Spurs, they are going to need to win a road game in San Antonio because if the series goes to seven games, facing a fundamentally sound and battle-tested Spurs team coached by arguably the greatest coach of all time in Gregg Popovich is a terrifying proposition. It is time for Denver to pull together and get a win in one of the toughest arenas in the league. One of the surprising standout players for the Nuggets in their four battles with the Spurs this season was none other than Most Improved Player candidate Malik Beasley, who is putting up phenomenal numbers against San Antonio. In four games against the Spurs, Beasley is averaging 19.3 points, 3.5 rebounds, and 2.3 assists against 0.5 turnovers while also shooting a scalding hot 50.9% from the field and 37.9% from 3-point range. While his raw numbers are great, what is notable about Beasley’s performances against San Antonio is that he has scored from everywhere on the floor in a multitude of different ways. As stated earlier, a goal of the Nuggets should be pushing the pace; especially in transition. Beasley has done that against San Antonio this year just as he does in the clip below. Beasley grabs the loose rebound and immediately goes on the attack. He checks for a trailing teammates at the half-court line, but the second that he sees Bertans slow down, he uncorks a eurostep and finishes at the rim. Beasley’s athleticism and speed could be a huge advantage for Denver if they can dictate the pace of the game so getting Beasley out in transition should be a priority of Malone and the Nuggets. In addition to his ability to get out in transition, Beasley has also been able to knock down triples versus San Antonio just as he has done all year for the Nuggets. The clip below shows how far he has come as an off-ball threat. Look at how Beasley stays ready for a pass to come his way and how he relocates as Plumlee makes his move. Because Beasley relocated from the corner to the wing, there was an easier passing lane to utilize. Then, once Beasley gets the ball, he is not sped up at all despite the shot clock rapidly approaching zero and he calmly, but confidently, splashes home the triple. Beasley has shown off his athleticism and 3-point shooting all season, but one of the more underrated narratives of his career-best year is how Beasley’s in-between game has grown tremendously. Look at how calculated Beasley is in the clip below. Now that Beasley has emerged as a lethal outside shooter, teams have to closeout harder on him. Because of that, Beasley now has significantly more opportunities to attack the reckless closeouts that come his way. Look at how Beasley anticipates the closeout, drives to the left because he knows that DeRozan is sprinting to his right shoulder and then calmly acknowledges Poeltl dropping back to the rim before rising up for a mid-range jumper. Beasley has an opportunity to be a difference maker in Denver’s first round series against the Spurs. He has the skill set to exploit multiple weaknesses that San Antonio has and, if he is able to produce anywhere near as well as he has in the first four regular season meetings, Denver’s odds of going to the second round of the playoffs would increase quite a bit. When the playoffs arrive, games tend to slow down and become more of a grind. In those type of games, having a long, strong, quick, and defensive-minded wing becomes even more valuable. Thankfully, the Nuggets have Torrey Craig who absolutely fits that role which is why he could be an X-factor for the Nuggets in their playoff series against the Spurs. First off, Craig is one of the very few players on the Nuggets roster who has the physical ability to match DeRozan’s quickness and strength as he does below. Regardless of Popovich’s clear anger towards the lack of a foul call, Craig did a perfect job of containing DeRozan when he isolated. Look at how Craig is fighting to push DeRozan out to the perimeter before he even receives the pass. Then, Craig makes DeRozan go to his left, keeps his body into him, doesn’t foul, and forces him into a tough floater. Craig is not only effective on the ball either. Yes, I know that Isaiah Thomas is not in the Nuggets rotation anymore, but look at how Craig recognizes the mismatch and eliminates the shot with authority. The Nuggets need off-ball defenders who can create turnovers and cause controlled chaos from time to time. Craig can provide that in spades while also providing some production on offense as well. In Denver’s last 15 games, Craig has been a very effective offensive threat. He is hitting 50.8% of his shots and also draining 45.7% of his 3-pointers to go with six points, 2.9 rebounds, and 1.1 assists in 17.2 minutes per game. Craig’s raw numbers may not blow people away, but his potential impact in the Nuggets first-round series against the Spurs is undeniable. So long as Denver does not beat themselves, they should be able to take care of the Spurs in the first round of the playoffs. The Nuggets have the best player in the series in Nikola Jokic, they have more offensive firepower as well as homecourt advantage. Nuggets should beat the Spurs in five games.